PROMOTE US: If your organisation is hosting an event or professional development education session, QDHP can provide promotional materials, educational information and presenters on doctors’ health. SUPPORT US: Please contact us if you or your organisation would like to support or provide sponsorship for QDHP’s upcoming events and projects. 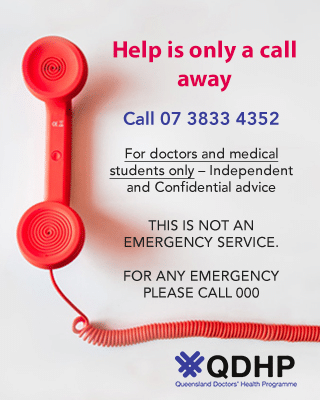 BECOME A DR FOR DRS ON OUR HELPLINE: QDHP is always in need of experienced general practitioners, interested in caring for doctors, to be part of the 24/7 Helpline panel. If you would like more details or to discuss further please contact us. DONATE: Contact our office directly if you wish to make a donation. Please note that we are a wholly owned subsidiary company of the Doctors’ Health Advisory Service QLD (DHASQ). Any support for DHASQ, a registered charity with TGR status, is deeply valued. If you wish to discuss how you can support and promote our services please phone 07 3010 5729 or email admin@qdhp.org.au.